Having never managed to get a ticket for Brighton SEO, (this year they all went in 13 minutes), I was genuinely pleased to see a spare one being offered on Twitter the day before. Jumping on the bandwagon and introducing myself to Janak, I was happy to receive it by email and the staff on the door, at Brighton SEO, were only too pleased to change the name on arrival. Great! I was in! There were a few people with sore heads from networking parties the night before, but it was fantastic to mingle and meet so many like-minded people who understood what you were was talking about. The first presentation, on AI and structured data, was given by Raj Nijjer, who confirmed what many of us anticipated will be the way forward with voice search. It was great to have insight confirmed by a specialist such as Raj. Purna Virji explained how our cameras were the new search and Will Cecil spoke about the challenges of developing an SEO data strategy from the frontline. From there I jumped to the power of simple Python scripts to automate SEO checks and then across to Content being data driven and measurement with GTM by Marcus Tober and Tom Bennet. Julia Ogden, Content Director at Zazzle Media, completed this session with a great 8 step checklist including Facebook Insights, ComScore, YouGov profiles and Global Web Index. The afternoon was consumed with paid search and paid social. Picking up useful info on how to get more quality leads from a PPC campaign by Jennifer Holt and Ned Poulter’s great tips on the true potential of social media advertising. This was no surprise as we had already experienced how powerful social advertising had become with our clients. 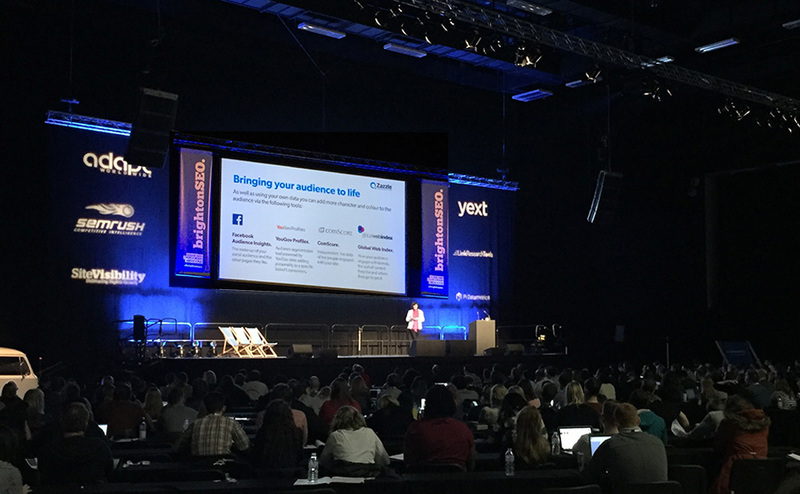 It wasn’t just SEO though – tips for optimizing e-commerce platforms, artificial intelligence, fake news, PR, PPC, lean marketing – well, there was enough for three days with 9 rooms in action throughout the day and many people so keen to absorb the advice and information that, for some seminars, even the floor space was filled. Identifying what is more likely to work, and what doesn’t, before you spent a lot of time and effort, is phenomenally useful and with literally thousands of SEO tactics that can be deployed, those tested techniques were like nuggets of gold. At Fine Marketing, we have always emphasised that, before you apply any marketing or SEO tactics, they need to be alighted towards your client’s business needs and objectives. This industry is moving faster than ever; you need to make the most out of expertise, identify what works, track the impact, ensure your tech is right to gain the best value and, try to stay ahead of the curve. The conference was certainly fully-loaded, packed with great seminars and a vast range of information that had been tried and tested, ooh and measured! Thank you, Brighton SEO.